Lemon GreenTea: OF BANK GLITCHES AND FRAUD, IS THERE CAUSE FOR ALARM? OF BANK GLITCHES AND FRAUD, IS THERE CAUSE FOR ALARM? 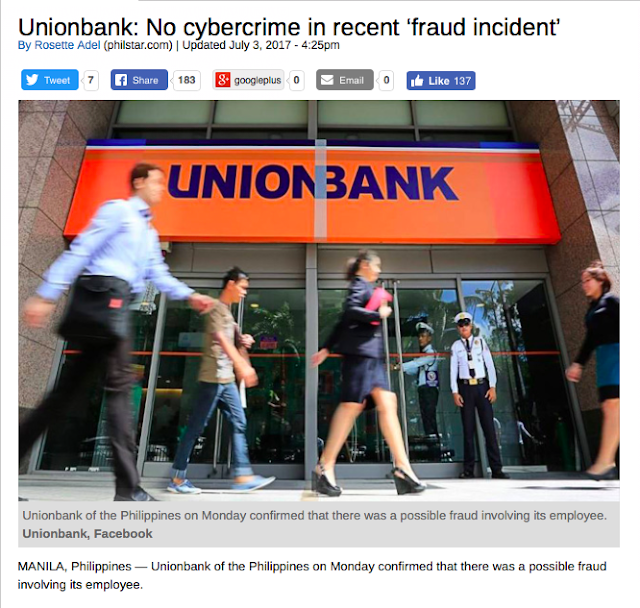 A few days ago, a UnionBank employee was arrested for allegedly stealing P17 million from a UnionBank branch in Pasig City. The arrest was made an unauthorized cash transfer from the bank's Ortigas Cash Center to its Caloocan Cash Center to allegedly cover-up the theft. The incident came just a few weeks after another bank suffered a glitch that caused erroneous debits and credits to depositors accounts. As a result a lot of people expressed concern with some users wondering how the incident was even possible under the watch of the bank with one of their employees involved nonetheless. Other are even having second thoughts about keeping their money in the bank following the tech issues from other major banks, and now with this news, people feel their money will be safer in their own hands. Some suspect an inside job and other conspiracy theories. But is there really cause for panic? To take this incident as a sign that keeping money in banks is not safe is making a giant illogical leap. Banks have large amounts of money, of course they are targets. The fact that these incidents are as isolated as they are, is a testament to how effective the redundant security measures they have in place really are. It is also worth noting that in all of the banking mishaps that have happened lately, at the end of the day, the worst thing that happened was a bit of inconvenience. As for the fact that this employee was caught stealing money, and the manner in which she was caught, should actually reaffirm our trust in the banking system and the safeguards they have in place. When you think about it, 17 million pesos is a small amount for a bank especially if it is “electronic money”, as opposed to physical cash. The fact that such a small amount was flagged and narrowed down to a single perpetrator quickly is even worth commending and that the money's electronic trail was far more fast, effective and accurate than any physical trail could ever be. Banks will always be targets of thieves, but I would rather have these thieves targeting my bank instead of my house. At least a bank has guards, layers of redundant security, and expertise and then finally insurance. 17 million pesos sitting in a home safe or anywhere other than in a bank would be enough to make anyone lose sleep, worse than that, if it were to somehow be robbed, there would be no getting it back, and people are more likely to get hurt or killed when that happens.